There's no one in the world today who knows the Stingray bass better than Sterling Ball. Back when Music Man was in its infancy, Sterling was the beta tester for Leo Fender and Tommy Walker's prototype designs, and he acted as the deciding vote on many design decisions when Tommy and Leo couldn't agree (being Ernie Ball's son certainly gave his opinion some weight!). For instance, his input was the impetus for the Music Man humbucker's original design! After much arguing between Sterling, Leo, and Tommy (not to mention lots of blood, sweat, tears, and tinkering!) 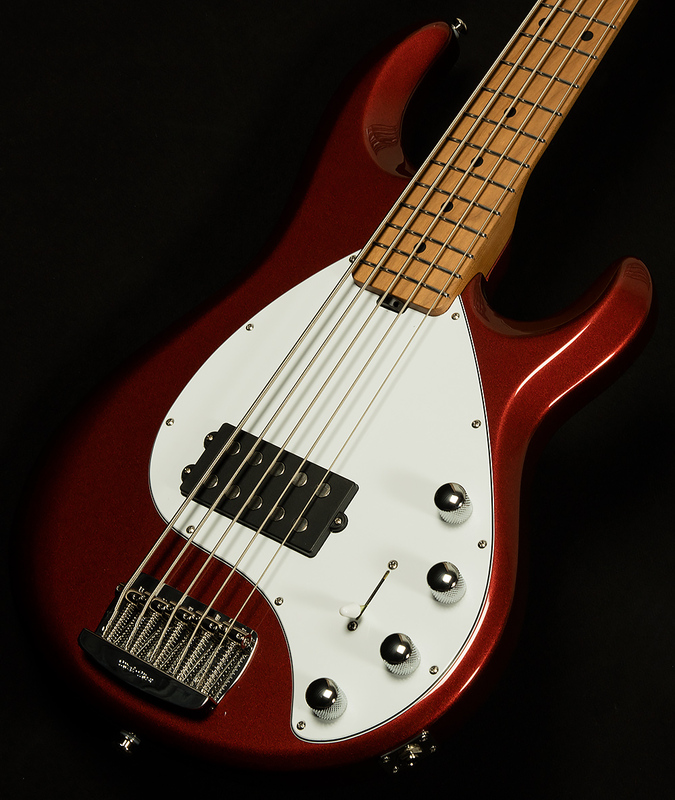 the Stingray was unleashed on the public in 1976, and it wound up becoming the go-to bass for everyone from funk masters like Bernard Edwards of Chic and Louis Johnson of the Brothers Johnson to thunderous rock players like Cliff Williams of AC/DC to session virtuosos like Pino Palladino and Tony Levin to heavy metal warlords like Rex Brown of Pantera. How did so many players of such diverse interests and tastes fall in love with the Stingray? Well, love is mysterious, but our theory is that the Stingray's signature sound delivers the sort of deep, clear low-end, bright trebles, and inimitable growl that works in almost every genre, and its powerful active electronics give players limitless tone-shaping capabilities on top of this enviable natural tone. As luck would have it, Sterling and his father Ernie were able to buy Music Man in 1984. The beta tester became the builder, and under the ball family's stewardship, the Ernie Ball Music Man Stingray bass became one of the most widely-beloved bass designs of all time. Nevertheless, an innovative company like Ernie Ball Music Man is never content to rest on its laurels, and for 2018 they decided to re-imagine the Stingray bass from the ground up. Under the watchful eye of Sterling himself, the wizards at Ernie Ball Music Man took their most iconic design and gave it a spectacular refresh. We are proud to present the fruits of their labor: the Ernie Ball Music Man Stingray Special in its five-string iteration. According to Sterling himself, the Stingray Special is the answer to a question: what would the Stingray look like if it were designed today? With this question as their guideline, the bass warlocks at Ernie Ball Music Man introduced all sorts of enticing new appointments that give discerning bassists a truly spectacular playing experience. First of all, the Stingray 5 Special features a roasted maple neck, which pays serious dividends for tone and reliability. Roasting a piece of wood makes it stiffer and more stable, and it also imparts a bit of vintage-style woodiness and focused resonance. It certainly contributes to the sweet sound and feel of these basses! Sterling and his team at EBMM have also changed up the Stingray's legendary preamp and pickups with an eye towards giving players more: more power, more headroom, more clarity, and more sounds. Though they kept the core of the classic Stingray sound intact, the addition of neodymium magnets in the pickups and an 18-volt preamp with a redesigned EQ have given it unprecedented versatility. An extra nine-volt battery in the preamp circuit gives the Stingray 5 Special more dynamic range while allowing the fundamental to punch through with awesome force. Meanwhile, the revoiced three-band EQ opens up a whole new world of enticing timbres for the adventurous bassists. The trebles still have all the clank and growl you'll ever need, but they're less spiky, and it is impossible to dial in an unpleasantly harsh sound. Also, the midrange produces a bright-but-woody fundamental, and it has a vocal quality that lends itself to expressive, melodic playing. The bass frequencies have been re-sculpted to give you all of the girth and muscle you need and none of the flub you don't. But, be careful: playing with the three EQ knobs can eat up hours of your time, because new iconic tones present themselves with each minute adjustment. Everything from bright, biting Rocco Prestia-esque fingerstyle funk tones to scooped slap bass sounds to thumping old-school warmth to girthy classic rock raunch to metal mayhem is only a couple twists of a knob away when you have a Stingray Special in your hands. Of course, the Stingray 5 Special also features the same impeccable build quality, fit, and finish that have impressed bassists for over four decades. Ernie Ball Music Man's manufacturing philosophy (which blends old-world handiwork with processes that utilize state-of-the-art technology) has led to several important innovations specific to the Stingray Special; namely, a new set of tuners that weigh half a pound less than normal, a five-bolt neck plate that promotes resonance and stability, a new neck heel contour that allows for supreme playability on the upper frets, and an extra upper fret for 22 in total! As a result, playing one of these basses allows you to experience the height of low-end luxury. Only a person as intimately acquainted with the Stingray bass as Sterling Ball could have overseen a project of this magnitude. It's a tall order to re-imagine, re-engineer, and rebuild one of the most beloved basses ever to summon the low-end thunder, but the Stingray 5 Special exceeded even our sky-high expectations. We are proud to showcase such vital, fresh addition to our selection of thud staffs, and we know the Stingray Special will bring any bass enthusiast lucky enough to take one home years and years of joyous inspiration.